Action Launcher Pro for Android is clean and simple launcher with a few excellent features, including a sliding quick drawer for apps and a completely new take on folders and home screen widgets. There are hundreds of Android launchers available in the Google Play store but one of our new favourites is Action Launcher. It's a clean and simple launcher with a few excellent features, including a sliding quick drawer for apps and a completely new take on folders and home screen widgets. 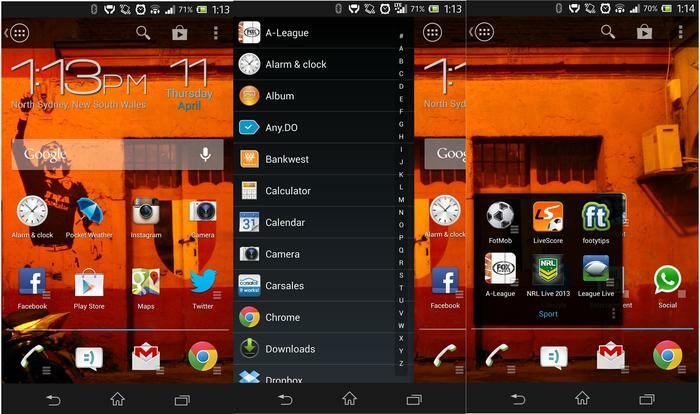 The brainchild of Australian developer Chris Lacy, Action Launcher is one of the cleanest Android launchers we've used. The main component of the launcher is a sliding quick drawer that lists your apps in alphabetical order. Action Launcher is one of the cleanest Android launchers we've ever used. The list has an alphabet index on the right side, so if you're looking for the YouTube app you simply tap "Y" to scroll down. Although it does take a bit of getting used to, accessing your apps in this manner is quick and easy. The quick drawer in Action Launcher is accessible by swiping to the far left page of your home screen. However, it is also revealed from any home screen when you swipe from the very left edge of the screen and can be accessed by tapping the app drawer button on the top left of any home screen. The list scrolls smoothly, there's minimal lag when jumping to a letter and the transition to open and close the quick drawer is fast and smooth. The home screen of Action Launcher can be tailored to use between one and five home screen pages and has a persistent bar across the top of the screen. Along with the app drawer button, there's a search button, a link to the Play Store and a menu key. The search button is very convenient as it can search through Google (web search) or your installed apps and contacts. Covers is a new take on folders that allows users to keep a clean look on the home screen. Action Launcher boasts two unique home screen features. The first is called Covers, which is a new take on folders that allows users to keep a clean look on the home screen. Simply make a folder of apps, open the folder, tap "make cover" and the folder icon will become whatever app is in the folder first. A single tap on any Cover will open the app shown, while a double tap or a swipe up on the icon will open the folder. A good example to make use of a cover is the phone app — make a folder with the phone app and direct dial shortcuts and you can tap once to open the phone app and double tap or swipe to quickly dial common contacts. It's a very handy feature and one that we really came to appreciate on a day-to-day basis. Shutters is the Action Launcher's other unique feature. It is basically a collapsible widget that allows you to swipe an app icon to view it. Like Covers, tapping the app icon on a Shutters-enabled app will open the app, but swiping up or down will display its widget. There's no way to select which widget is used as part of the Shutter for apps with multiple widgets. The widget is automatically created when you drop an app shortcut onto the homescreen, but there's annoyingly no way to select which widget is used as part of the Shutter for apps with multiple widgets. The feature will only work for devices running Android 4.1 Jelly Bean and above and widgets in a Shutter can't be resized. Conveniently, users can put shutters inside Covers or regular folders. You can also use regular widgets in combination with Shutters on the home screen if you wish. 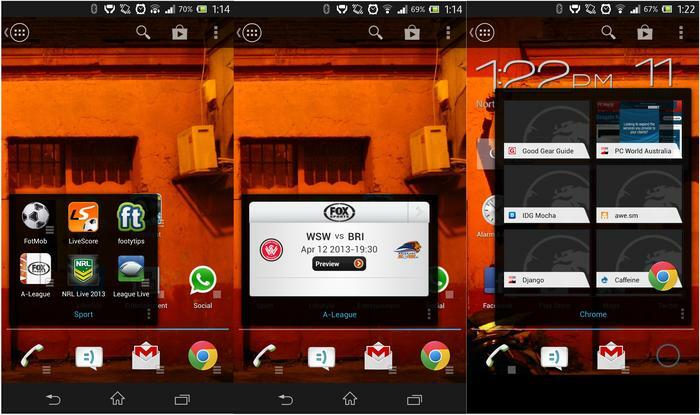 Overall, the Shutters feature provides all the functionality of widgets but eliminates much of the clutter, a common criticism of the Android home screen interface. There are a few tradeoffs that come with Action Launcher that you should be aware of. Firstly, the customisation options aren't as extensive as many other Android launchers we've used. You can hide apps from the quick drawer, adjust the number of home screen pages, and change home screen grid sizes but more advanced options like using alternate icon packs, editing screen transitions and enabling a scrolling dock bar aren't available. 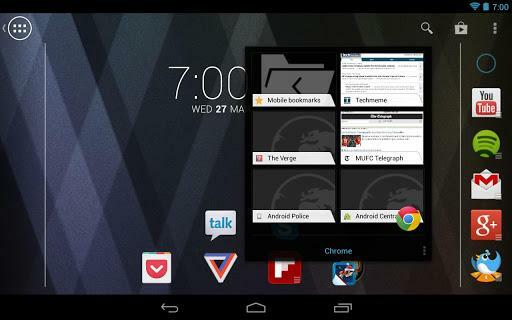 Action Launcher supports Android tablets including the Google Nexus 10. There are also a few bugs that need to be ironed out. You need to specify your phone's default launcher after every reset and the app can become a little unstable at times. It's usually fixed by clearing the cache in the settings but it does become an annoyance and can slow your phone down. Action Launcher includes the ability to import your home screen layout from other launchers including Apex, Nova, TouchWiz and the stock Android launcher. The app also offers full tablet support.